Cadavers, camera, action! (The New York Times Book Review). From the advent of photography in the 19th and into the 20th century, medical students, often in secrecy, took photographs of themselves with the cadavers that they dissected: their first patients. 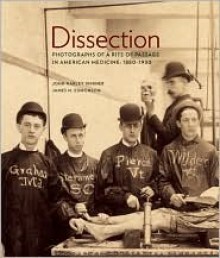 Featuring 138 of these historic photographs and illuminating essays by two experts on the subject, Dissection reveals a startling piece of American history. Sherwin Nuland, MD, said this is "a truly unique and important book [that] documents a period in medical education in a way that is matched by no other existing contribution." And Mary Roach said Dissection "is the most extraordinary book I have ever seenthe perfect coffee table book for all the households where I'd most like to be invited for coffee."